England 6-165 (Michael Lumb 63, Alex Hales 38, Chris Jordan 27*, Krishmar Santokie 2-27) beat West Indies 7-160 (Lendl Simmons 69, Denesh Ramdin 33, Jordan 3-39, Ravi Bopara 2-28) by five runs. The visitors hammered 165 for the loss of six wickets in 20 overs and the hosts were restricted to 160 with three wickets in hand. 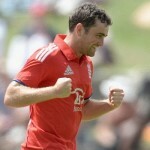 Chirs Jordan (England) was announced ‘Player of the match’ for his excellent performance both with the bat and the ball. Darren Sammy, the captain of West Indies was declared ‘Player of the series’ for his astonishing batting and leadership. The third and final T20 of the series was played on Thursday, March 13, 2014, at Kensington Oval, Bridgetown, Barbados. Earlier, Eoin Morgan, the skipper of England, won the toss and preferred to bat first. Michael Lumb and Alex Hales took off brilliantly by smashing 52 runs in four overs with 2 sixes and 9 fours. The first was the most attacking of the two, he dispatched his third T20 fifty on the 27th ball and became the first victim at 98 after scoring 63 off just 40 deliveries comprising 2 lofty sixes and 9 fours. Hales was gone next at 112 for 38 as the rival bowlers took charge and the wickets started sliding at regular intervals. Chris Jordan played an unbeaten hurried knock of 27 from 9 balls with 4 sizzling sixes as the visitors powered 6-165 in 20 overs. Krishmar Santokie and the debutant, Sheldon Cottrell, were the top wicket takers with two each whereas Sunil Narine got one. West Indies had an awkward beginning of their innings and lost their three top order batsmen for 28 runs in 4.2 overs. Lendl Simmons along with Dwayne Bravo tried to force the pace and took the score to 66 when the latter surrendered his wicket for 16. 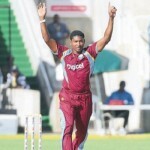 The Windies were 5-67 when Denesh Ramdin joined in with Simmons and they started playing their shots freely. The latter reached his fourth T20 half century with a boundary and the partnership was dislodged at 140 as Ramdin departed for 33. Lendl Simmons was finally run out 13 runs later for 69 off 55 with 2 big sixes and 7 fours as his team managed 160 with three wickets in hand. 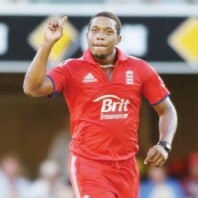 Chris Jordan was the star of the day with three wickets, Ravi Bopara held two and Jade Dernbach chipped in with one wicket. England won the encounter with a little margin of five runs but West Indies sealed the series at 2-1.